Photo: Don Cameron, Maine Natural Areas Program. Drawing: USDA NRSC. 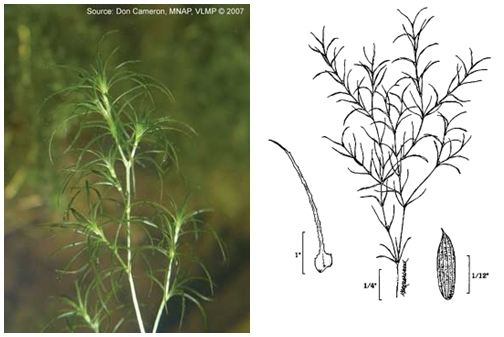 European naiad grows tufts of spiny, stiff, arched leaves on stems that may be up to 2.5 meters long. Unlike native naiads, the serrations on European naiad leaves are visible without magnification. Spindle-shaped seeds grow in leaf axils; flowers are inconspicuous. European naiad was introduced to the United States from Europe in the early 1900s. It is a true annual, reproducing primarily by seed. Relatively small infestations may produce tens of millions of seeds that are dispersed on air and water currents. It has been confirmed in New Hampshire, Vermont and Massachusetts.